With all major design aspects settled by mid-1995, the consultant teams spent the next year finalising production drawings, bills of quantities, logistical arrangements and supervision staffing arrangements. Notwithstanding the obvious folly, in the political and security uncertainties of the time, of building the embassy with private finance, the FCO was obliged to commission consultants to examine the case in some detail in late 1995. Negative reports were received a few months later, and the Private Finance Panel Executive formally confirmed that it did not think Moscow was a practicable PFI project at the end of March 1996. With that consideration out of the way, the Treasury gave the FCO financial approval in May 1996 for the whole project, including all fees, travel and furnishings,in the sum of £81.2 million in May 1996. The FCO had decided earlier in the design process that the structure of the unclassified offices wing should be capable of taking another floor for visa-issuing in case the demand should grow so much as to require it. It did, and the extra floor was included in the approval. Tenders were issued to five pre-qualified contractors in May 1996: Laing-Loy Management, Tarmac Construction, Taylor Woodrow International & Skanska Oy Joint Venture, Trafalgar House Construction & Terasbetoni Oy Joint Venture, and Tilbury Douglas Construction. The pre-tender estimate was £60million, for a building of 21,200 sq.m., to house 250 staff (30% of them UK-based) in offices, and including 31 staff flats and 85 covered parking spaces. Tenders were opened in August 1996, and ranged between £58 and £65 million for a 30 month contract period. After detailed examination, TWS (the joint venture between the British contractor and the Finnish subsidiary of the Swedish firm Skanska) emerged as the winner of the contract. Within the joint venture, the contract management was to be British and the construction management Finnish. Preparatory work started on site in November 1996; a ground-breaking ceremony was held at the end of January 1997; and two contracts with TWS, for tax reasons one onshore and the other offshore, were signed in February 1997 in the combined sum of £59.5 million. The security strategy that had underlain the negotiations with the Russians, and was designed into the scheme from the outset, was put into full effect. An inner security perimeter was built around the classified offices block into which only vetted British labour ever had access. 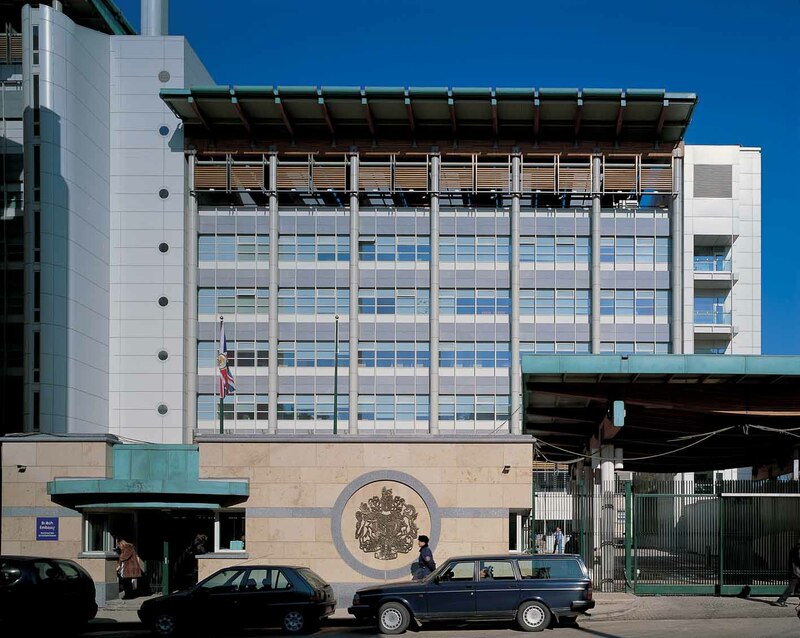 All of the construction materials and elements for this block were shipped from the UK in containers to Helsinki and driven to the site in Moscow as diplomatic bags, immune from examination or tampering. 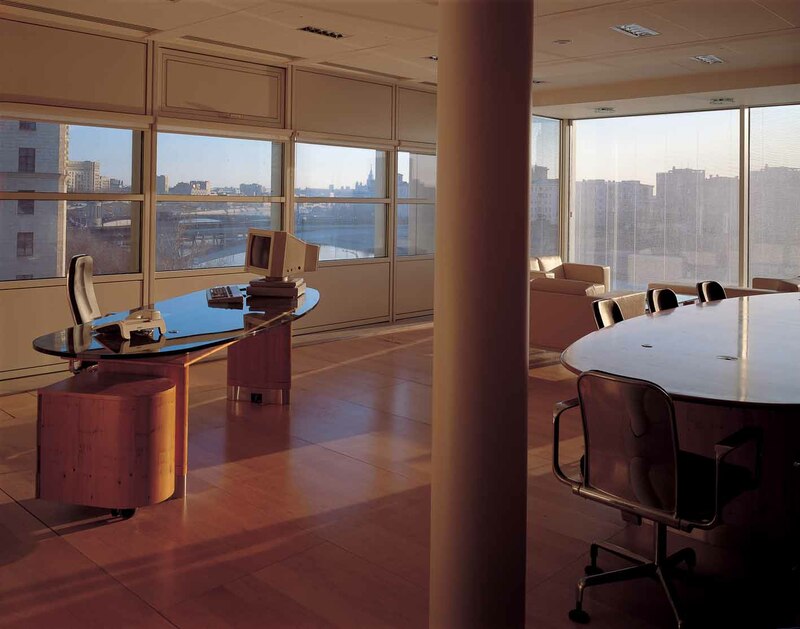 An Arts Policy for the building was agreed upon in principle in 1995, to be considered in tandem with the interior design and furniture issues. 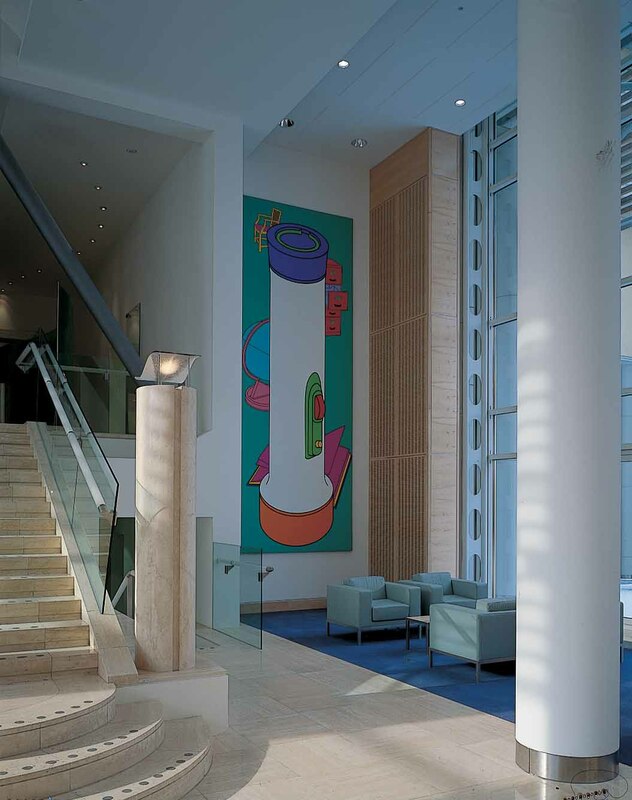 Burton’s previous championship of the nation-wide Percent for Art campaign, which encouraged clients to set aside a small percentage of their building budgets for artworks, was a key stimulus. The FCO had the broad intention to allot about 0.5% of the original building budget, £300,000, to artworks, and to form a specialist committee to oversee the selection and management of the arts programme. There were, of course, overlaps with both the building and furnishings budgets. The result was a fine range of artworks. Those commissioned included: a coat of arms by Roman Halter, 31 enamel panels of text, the layout of the granite setts in the forecourt, a double-height metallic etching by Norman Ackroyd, paintings by Michael Craig-Martin, a glass wall by Alexander Beleshenko, two relief paintings by Langlands and Bell, six printed wall texts, and a projected transparency by Alex Hartley. A magnificent water sculpture by William Pye intended to sit in the landscaped area in front of the building proved too expensive at a time that sponsorship was drying up. There was a topping out ceremony at the end of May 1998, the building was completed in late 1999 and FCO began full occupation at the end of February 2000. It was opened by HRH The Princess Royal in May 2000, in the presence of both Russian and British Foreign Ministers, Igor Ivanov and Robin Cook, and to general plaudits. A booklet about the building, written by Jeremy Melvin and edited by Mark Bertram, was published at the same time. The three residential blocks were called Jenkinson House, after Anthony, the first ambassador to Russia 1571-2; Keeble House, after Sir Curtis who was ambassador 1978-82; and Wood House, after Sir Andrew who was ambassador 1995-2000. The contract overran by about six months. The FCO’s analysis was that the final account sum payable to TWS should be of the order of £72 million (a 21% excess of the contract sum). TWS submitted a claim for a final account sum of about £97 million (a 63% excess). An extended and cantankerous dispute resulted in an agreed final account in early 2002 of £82.3 million (an excess of 38%). The Treasury’s approval for the whole project of £81.2 million (which included fees, furnishings etc) therefore ended up being exceeded by 22%. 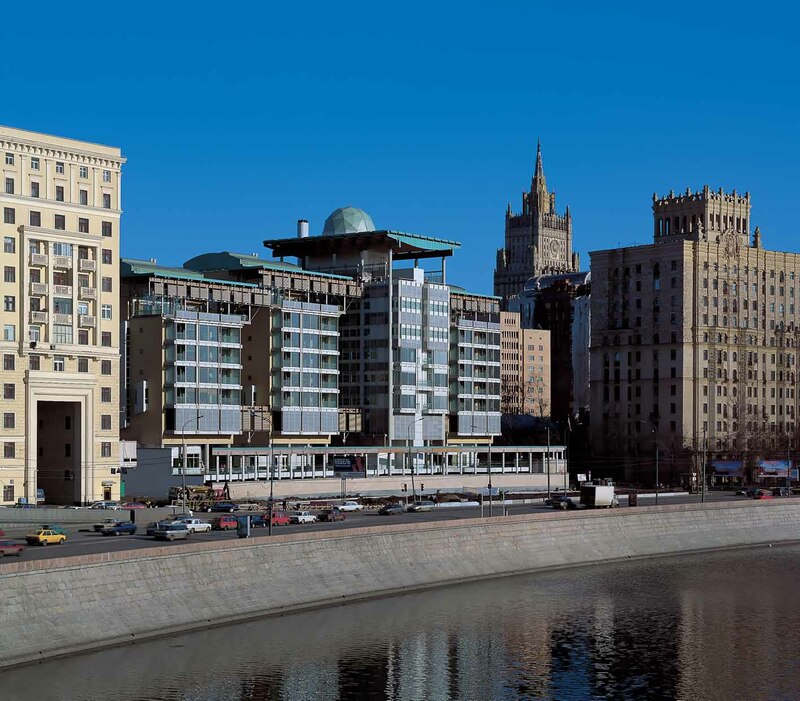 With the completion of the offices and flats on the Smolenskaya site, and the securing of the Sofiskaya site for the residence and some staff accommodation, the British achieved all that was envisaged by the reciprocal arrangements in London and Moscow. While the loosening of reciprocity and concurrence in the mid-1990s had enabled the British to forge ahead in Moscow, it also enabled the Russians to do rather little in London. Their main development site at 1-5 KPG remains as it was in the 1990s, despite the occasional flurry of activity, including when President Putin apparently wished to lay a foundation stone at short notice in 2005. And the Russsians sold their interest in their second site, 245 Warwick Road, with the co-operation of the FCO, for £24.5 million in 2005. The original British intention was to refurbish the Sofiskaya buildings as soon as the offices vacated them for Smolenskaya. But, when the time came, the FCO found that there were higher priorities requiring funding, and there was no agreement about whether to allocate the whole of the main building to the ambassador’s residence or whether to insert some staff flats into the building. It was the kind of debate that highlighted the different world views of senior diplomats and property managers: the former, as so often, won. The British asked the Russians for permission to remove the rear extension from the main building, added after significant argument in 1911 and used as the ambassador’s office from 1930 until 2000, because it was not needed, was in poor repair and spoiled the relationship between the house and the garden. After extended debates with the Ministry of Culture, the Russians refused permission. A three phase programme for Sofiskaya was selected. 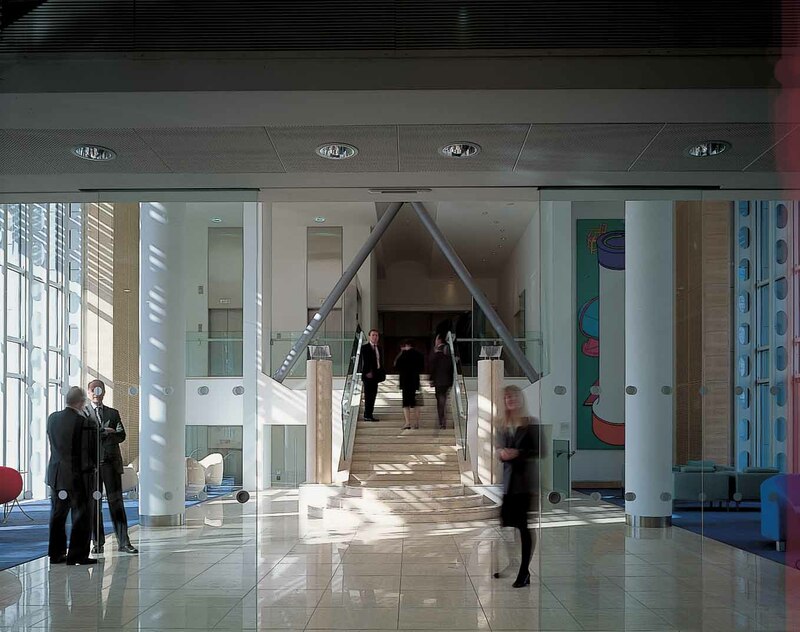 Accordingly, the East and West Wing blocks were fully refurbished in 2002-3, and the main building in 2007-2011, through a difficult and expensive contract but to magnificent final effect (and without any staff flats). The third phase, the Garden/Stable block, awaits its turn. Embassy frontage to the river. View across main hall to stair to transverse corridor. Michael Craig-Martin’s Lighthouse in the main hall. The ambassador’s office, with desk made by Luke Hughes. 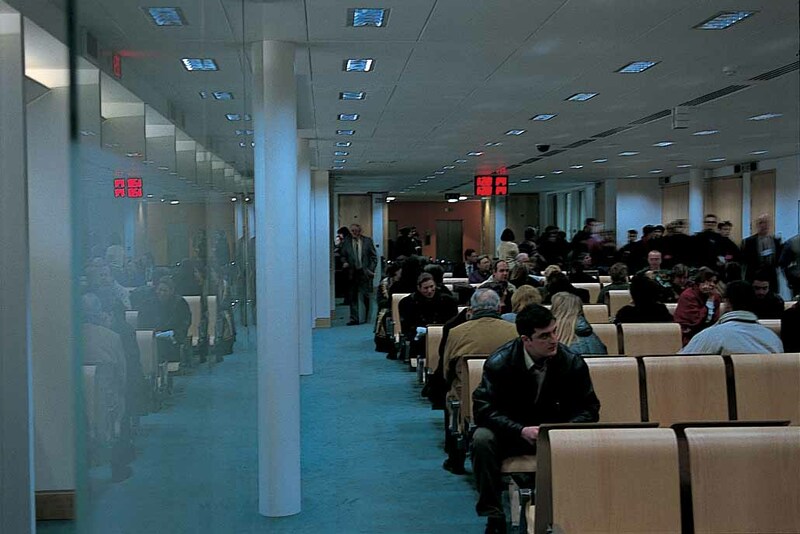 Waiting room for visa applicants in offices wing. 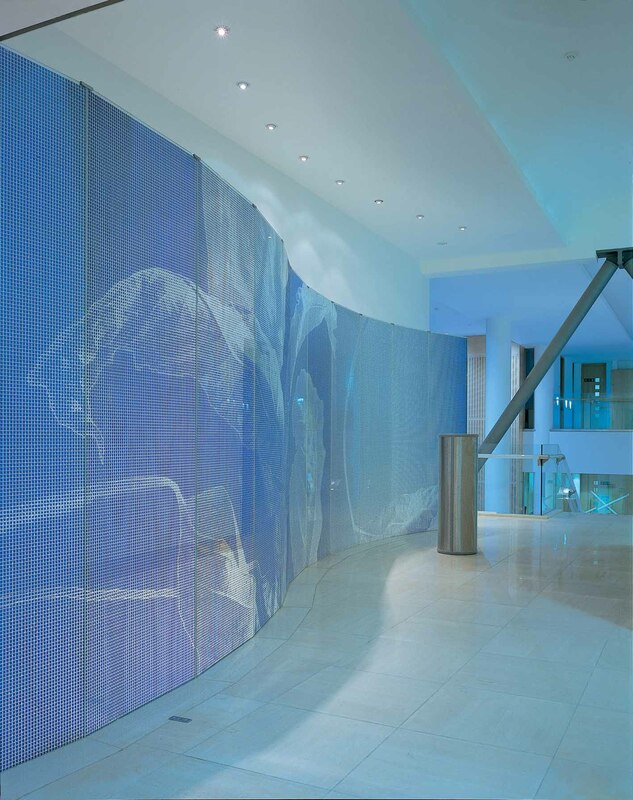 Glass screen by Alexander Beleschenko, connecting the main hall to the main corridor.